In order to estimate the grape size, we recommend you use a probe circular object which can be inserted into the grape bunch while taking a picture. This allows the app to have a real world reference point to help the app estimate the size of the grapes more accurately. All you have to do is line up the probe with the centre marker while taking a photo with the app. You can insert the probe diameter in the App Settings. The app can be used without using a probe as well, though the size estimation will be less accurate. 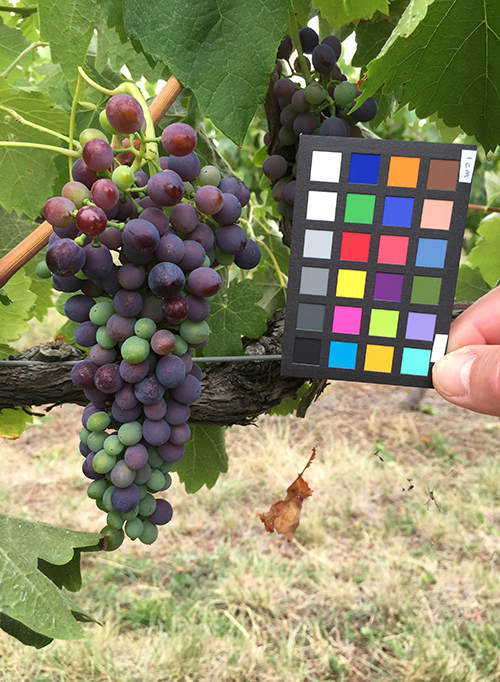 The colour of the grapes is measured from the image taken, so ensuring that the lighting is even and consistent is important, as shade and other weather conditions can affect the colour measured in a given photo. We recommend pictures be taken in similar weather and times of day, with sunny weather being ideal. You can view your grape analysis results by vineyard, variety and season and see how the colour and size have progressed over time in the Analysis results tab. This section displays the results over a given period of time in the form of a graph, and these results can be saved in jpg format.